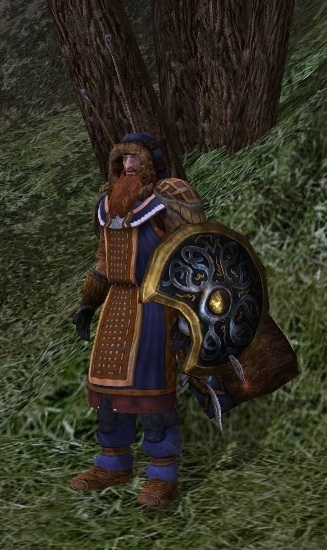 LotRO | Nuts and bolts. Mostly nuts. We had our first snowfall of the season where I live. So, it was only right that Burhhelm should roust himself and check out this year’s Yule Festival. While they added a new instance to the Shire for the Harvest Festival, they have added a full mini-zone for Yule. The themes seem to be somewhat Dickens-esque. Overworked and underpaid workers, desperate beggars, and picking the pockets of the wealthy are a few of the recurring quests. There is also a play where you must act out emotes or risk being pelted with fruit and so forth, but I’m not sure how that ties into the holiday theme. To be blunt, this festival is not up to snuff. The quests are great, if you want to play a character who is into skullduggery, stealth, and somewhat larcenous. Neither Burhhelm, nor any of my alts are that sort of character – and I have no use for it myself, on a personal level. Is the mayor of the town a tyrant? Kick his arse. Problem solved. The evil mayor has turned the town guards into his own private army to enforce his will on the citizens? Fine, kick the guards’ arses. The rich citizens are hoarding all of the food? Kick their arse and give the food to the poor. The hobbits are having trouble putting on their play? Kick their arses – they are hobbits and richly deserve it. Kicking arse – is there any problem that it cannot solve? If I were to rate this festival, I would give it 2 of 5 stars. 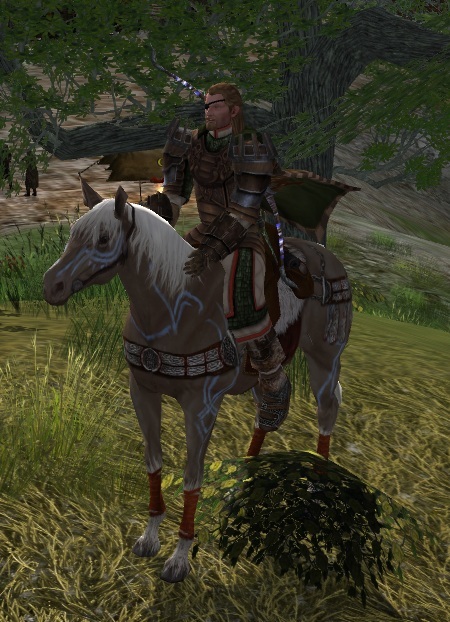 It is an average MMO attempt at a holiday activity, but it has little-to-no tie-in with Middle Earth. You can skip it and not miss anything. Which is a shame, really – it is a missed opportunity for the game. And that may be just enough. … he also has the rest of Eriador fooled as well. OK, some reactions. Such as “what the heck is with that flagpole stuck in the horse’s saddle?” I really don’t know, and I find it a little bizarre. Frankly, I prefer the Algraig mount to either of these two horses. However, they have additional speed, which makes them slightly more useful in large zones. 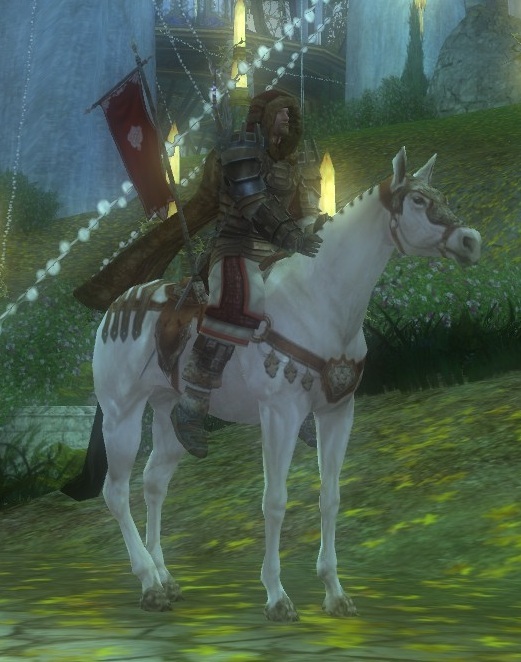 Maybe one day, Turbine will allow us to use a sort of costume system for mounts, so we can use whatever skin we want for our horse, regardless of the way it looks. Speaking of costume pieces, Turbine has added a mess of them to the online store. Helm of Rohan, Elven cloaks, and even the Hauberk of Glory are available. If you have the points, go ahead and browse. You can beat on Hobbits in some of the quests. I approve. I’ll admit it, I enjoy visiting places in LotRO just because I want to visit them. Thus, when someone in my kinship asks if there’s any interest in an instance run, I usually sign up as a standby, in case they need an extra person. I just enjoy visiting instances – developers put a lot of work into them, and they are usually pretty well polished. Usually. 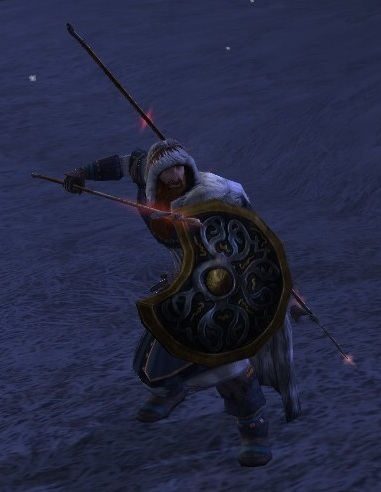 As I mentioned in my last post, Burhhelm volunteered his sword arm for a Moria instance run. It turned out that he was needed, as a few people did not show up. No problem, I grabbed a few extra potions and was ready for action. First stop: the Grand Stair. I’ve never seen all of the Grand Stair. People only hit a few bosses to complete the “hard mode” quest and grab some medallions. This trip was no different – and for a group with multiple level 65s, it is no real challenge, so long as you have enough fear removal potions and enough healing to go around. It took longer to get the group together than it did to complete the fights – not exactly exciting. Since the evening was young, someone suggested that we hit Skumfil, a dungeon in the Foundations of Stone. I’d never been to this place, so I was pleased to go. 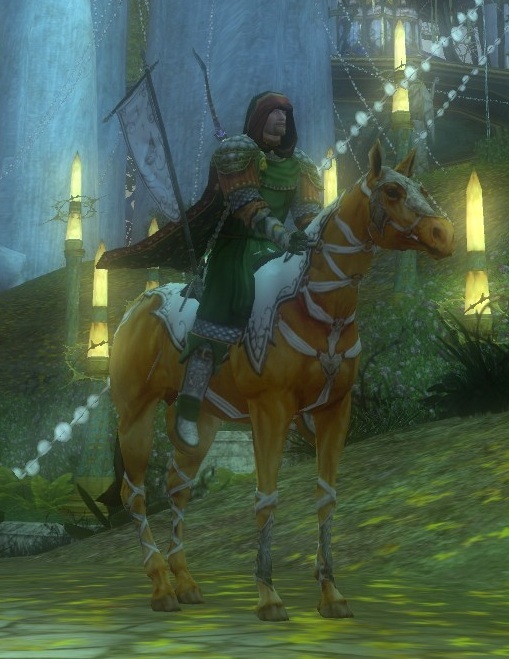 Besides, I have been toting around the final Martial Champion quest for over a year. Skumfil is full of bugs and fish monsters (who resemble the Deep Ones from H.P. Lovecraft). If you have weapons with bonuses against insects and beasts, then you’re set. Almost. There is one catch: this place is buggy (as in computer bug, not insect) as heck. Our tank would run up to some mobs, hit them once, and the mobs would sink into the ground and leave the whole group stuck in combat. This happened three times – two times, this could only be fixed by the intervention of a GM. 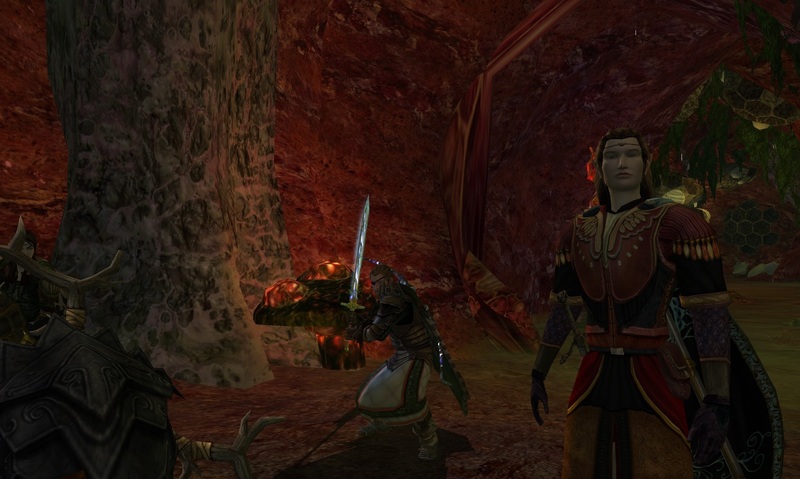 We completed the Minstrel and Champion quests, but wow – avoid this place unless you have no other option. I was going to turn in, but someone asked if we could hit Ost Elendil. I was game – I am quite familiar with the place, now. No surprises, the whole instance went smoothly as we gradually ground each set of mobs into the turf. The theme of the entire instance is pulling mobs into the sunlight to crack their defenses, then pulling them into starlight to finish them off. Except for the final boss, that is – just beat him down in the sunlight. I guess he sunburns easily. I just hope that the Annuminas marks went to good use. A different group, different instances. Well, mostly. We visited Ost Elendil again – always a pleasure, and almost always an easy instance. We were hampered somewhat in all of the instances on Sunday due to the Captain in the group being out of practice and geared with level 60 stuff. Actually, I don’t think the gear was the problem; they just hadn’t done enough grouping lately to really work with everyone as a team. He fought as if he were solo, without assisting with the healing or removing crippling fear effects. I thought our poor Runekeeper was going to have a nervous breakdown while trying to keep up with the healing on their own. After finishing Annuminas with only one group wipeout (there really should have been none, though), we went through each of the Great Barrows instances. We failed the challenge in both the Maze and in the second instance, which was frustrating. We did manage to finish Sambrog’s challenge, though.